Having sight words around your house is a great way help beginning (or struggling) readers. Sight words are easy to make (psst…here’s how I made mine) and you can do lots of learning activities with them. 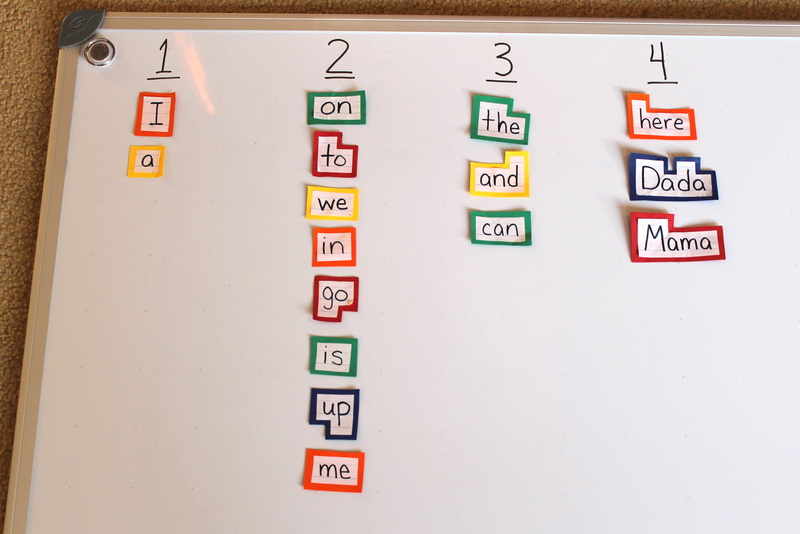 In a classroom, there is a “word wall” where sight words are displayed so they are easily read/spelled. Why not try something similar in your home? How do I display sight words? on the fridge- This is great because they can easily be reached by little hands and moved around. However, they end up jumbled and might be difficult to find. on a large whiteboard- It’s movable and you can write on it! easel- This is another movable option that doesn’t take up wall space. How do you organize the sight words? alphabetically- Teachers usually organize their sight words alphabetically. It’s easy to find words if you know the first letter and it’s a good way to practice ABC order. number of letters- Kids can practice counting while they rearrange words in a different way. tall, small, fall letters- Some letters are tall (t, b, l) some fall below the line (g, p, y) and some are small (m, o, a). Organize the words into groups according to their shapes. words they know/don’t know- Just like flashcards, split into two groups of words they can easily read and words they are still working on. Then watch the “know” group grow! any group that makes sense- Experiment with different groupings. Rearranging sight words means your kiddo is reading, thinking, and organizing words. All good things! My 2 year old has been showing an interest too so I started putting her favourite short words on Post-its for her to play with and recognise but I like your way much better!